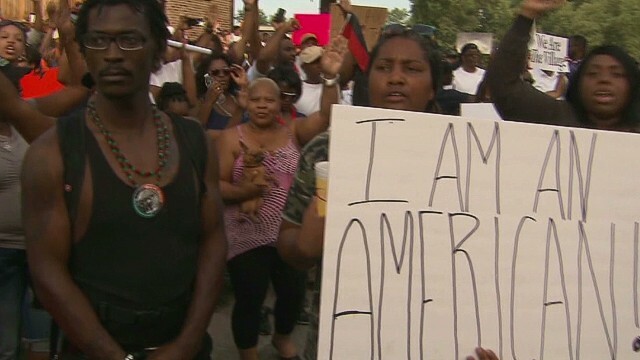 Tensions ease in Ferguson, Missouri, in the aftermath of Michael Brown's killing. Robin Williams' wife says he had Parkinson's disease. And Major League Baseball has a new commissioner. Tensions ease: Ferguson remained at peace overnight for the first time since Michael Brown was killed. And protesters have learned that their demand to know the name of the officer who shot him may be met soon. Brown, an African-American teen, was shot to death Saturday. The crowds swelled and became more diverse Thursday; their chants for justice accompanied a concert of honking car horns. And though their cause was somber, their mood was buoyant. Many praised a new security arrangement, now lead by the Missouri State Highway Patrol, for the change of tide. Stepping down: Iraqi Prime Minister Nuri al-Maliki has given up the fight to keep his post, clearing the way for a new leader that many hope can mend sectarian divisions as the nation battles brutal extremist fighters. In a televised address yesterday, al-Maliki withdrew his candidacy for a third term and endorsed Prime Minister-designate Haider al-Abadi. Government forces are battling Sunni fighters with the so-called Islamic State, formerly known as the Islamic State of Iraq and Syria or ISIS. Words from his wife: Robin Williams was sober but was struggling with depression, anxiety and the early stages of Parkinson's disease when he died, his widow said yesterday. The diagnosis of the progressive illness was "an additional fear and burden in his life," a person familiar with Williams' family told CNN on Thursday. Williams was found dead in his Northern California home Monday from what investigators believe was a suicide by hanging. Taking time off: Celine Dion is putting her music career on hold indefinitely because of her husband's cancer and her own illness, the singer announced this week. Rene Angelil, 72, underwent surgery to remove a cancerous tumor from his throat last December and has stepped down as his wife's manager. Dion is suffering from "an illness that has caused inflammation in her throat muscles," her website said. Dion has canceled her Las Vegas shows and a tour of Asia. Up to bat: After 22 years with Bud Selig in charge, Major League Baseball didn't look far for his replacement - tapping his right-hand man and longtime league executive Rob Manfred as its next commissioner. Owners of the 30 Major League teams elected Manfred during quarterly meetings in Baltimore yesterday. Manfred is the 10th commissioner in MLB history. - Flipside: What the heck is this guy painting? - Organic Etch-a-Sketch: Who thinks to do this? - Cute little guy: Set up a camera in the wilderness and there's no telling what you'll find. But if you're wondering, this is a marmot. - Destroys the competition: Britain's Jo Pavey becomes the oldest female European champion, winning gold in the 10,000 meters at age 40. –Enough said: We really like this tribute to Robin Williams. Celine Dion and Rene Angelil I wish you both well. What an amazing gifted talent that artist possesses!!!!!!!! Jo Pavey!!!!!!!! YOU GO GIRL!!!!!!!! Have a beautiful, wonderful, enjoyable fun weekend everyone!!!!!!! !